1. 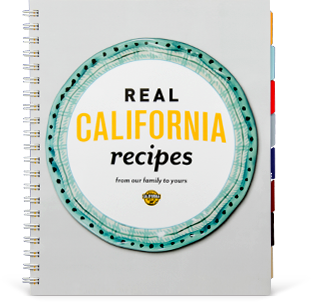 In a large bowl, or in a food processor, combine the Real California cream cheese, garlic, salt and cayenne pepper. Beat or process until blended and smooth. Add the Real California monterey jack and blue cheeses, as well as the walnuts, and beat vigorously until the ingredients are evenly mixed. If using a food processor, take care not to over-mix; the cheese should retain some of its texture. While chilling is not essential, at this point the mixture will be easier to shape if refrigerated for 2-3 hours.2. Spread the rye cracker crumbs on a large plate or sheet of waxed paper. Dampen your hands with water to keep the cheese mixture from sticking to them. Divide the cheese mixture in half, then pat and press each half into a log about 3 inches across; don't worry about keeping the shape perfect. Roll each log in the cracker crumbs, pressing gently so the crackers stick. Wrap each cheese log separately in plastic wrap and chill until serving. 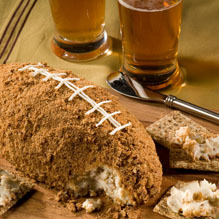 This cheese log may also be shaped into a more traditional cheese ball shape, if desired.